During the past few weeks I've been holding a pen and ink drawing class in my studio. 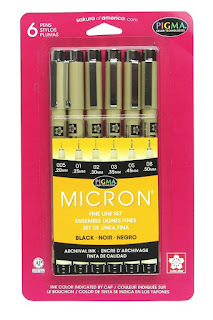 Instead of using the portable ink pens that are popular these days, such as Micron or Copic, we've been using dip pens. I personally love using them. 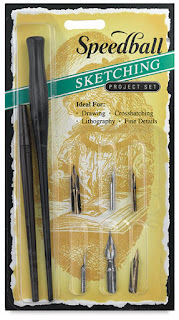 Most people don't consider the dip pen for drawing, perhaps it's because they think these pens are for calligraphy. But I'm here to tell you that dip pens are perfect for drawing. They may seem out of fashion, but they are alive and well today. 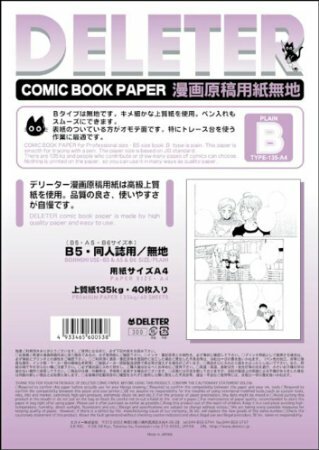 Artists who render comics, especially Manga, use them all the time. Why? 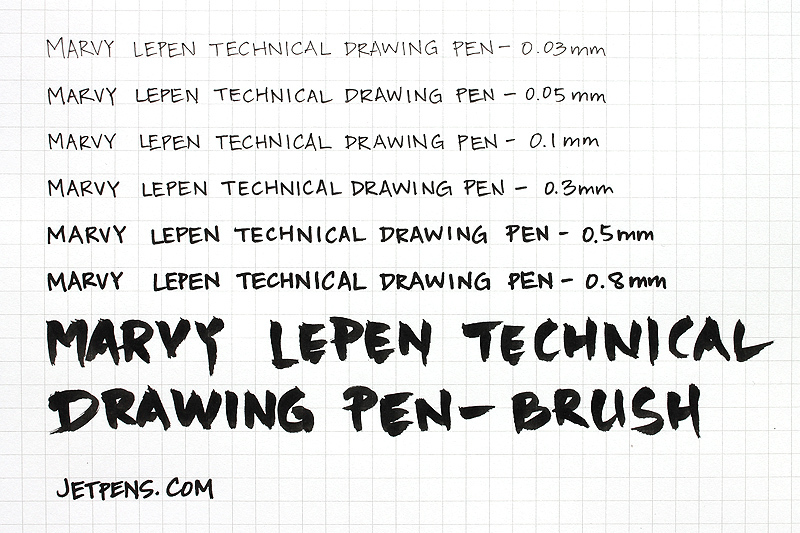 Their flexibility is amazing and you can get exceptionally thin lines, depending on the nib you use. But I'm getting ahead of myself. 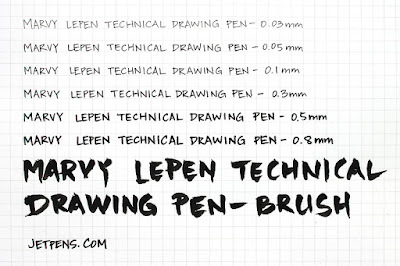 Let me first give you some technical information, starting with the the pen's history. Up to the Dark Ages, scribes used reed pens. 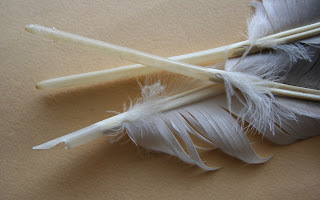 Then came along a new invention: quill pens created by pulling the top feathers from a bird's wing, burying it in the sand so the point would harden and then shaping it into a pen point with a knife. This continued for 1500 years. Many of our documents from the Magna Carta to the Declaration of Independence were penned with these instruments. 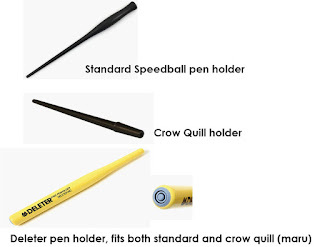 Interestingly, the quill pen needed to be "sharpened" frequently and usually didn't last more than a week. It's said, that Thomas Jefferson raised his own geese to keep him in the ink (so to speak). The hardest part was catching the birds. Goose feathers were most popular and the swan feather was considered best of all. The crow had the honor of having the best feather for drawing. At one time, Britain imported 27 million quills from Russia per annum. easy to make, thus affordable. Some say that the nib pen actually increased literacy because now everyone could own a pen and learn to write. Are they called dip or nib pens? That depends. Actually, these pens are called either dip or nib. 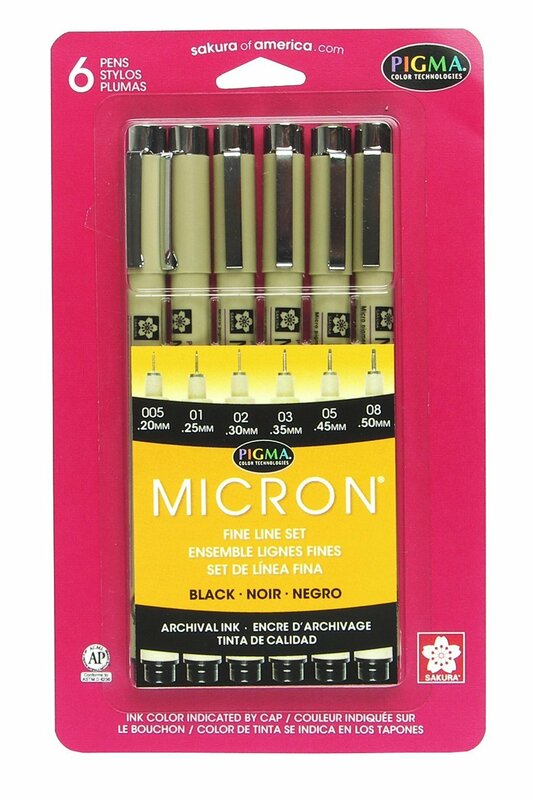 Most comic artists refer to these pens as nib pens; the rest of us call them dip. It really doesn't matter. Both are correct. 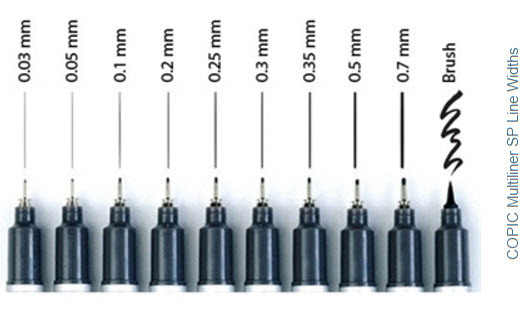 Generally speaking, you do not have a reservoir in a nib as you would in a fountain pen. To recharge your nib, you dip it into an ink well or bottle. 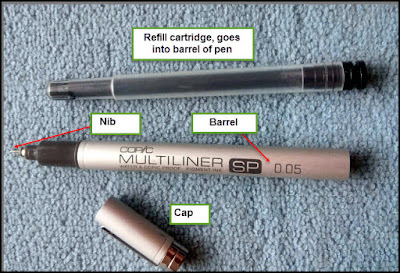 A lot of illustrators don't bother dipping at all but instead use eye droppers, syringes or brushes to fill the nib with ink. There is also a handy little tubular reservoir you can purchase that clips onto the nib, which gives you more time to draw between recharging. Depending on the nib you use, it truly is surprising how long one ink charge lasts. Just like with any other art medium, there are lots of stuff you can choose from. For instance, there are a variety of nibs. On the American side, I like Speedball/Hunt No. 512 and No. 513. The 512 is considered extra fine and the 513 is called the globe or bowl. Both hold a goodly amount of ink with the 513 holding a bit more, which means you have a longer time to spend drawing instead of dipping. For extra fine work and nib flexibility, you can purchase the crow quill. You can easily identify these nibs because the shank looks like a crow's feather quill or calamus. There are several to choose from but I prefer the Speedball/Hunt No.102 and Speedball/Hunt No. 107. 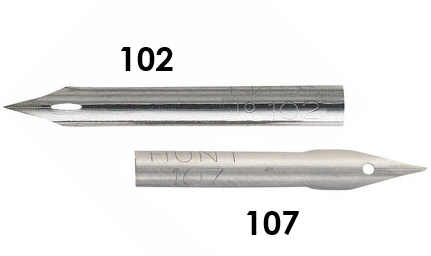 The 102 is highly flexible, which means you can put pressure on the nib while drawing and create thicker lines. 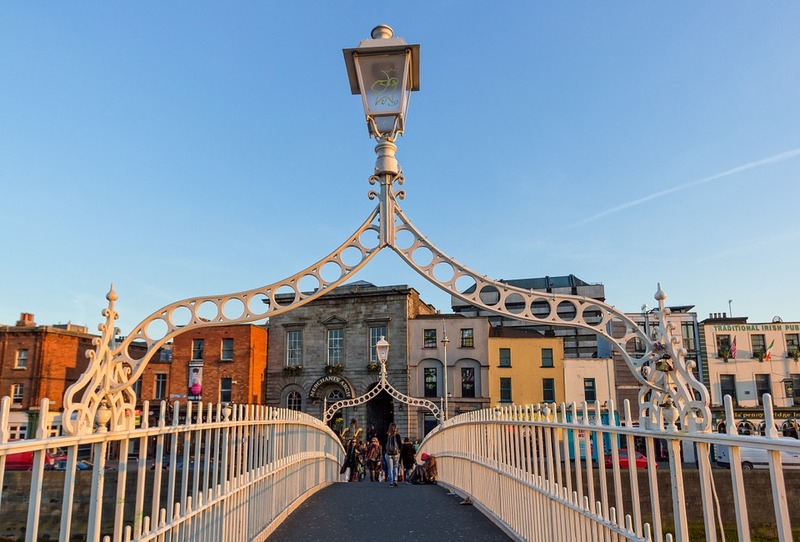 The 107 is stiffer and creates a very lovely fine line, but is not as flexible as the 102. Another good source of quality nibs comes from Japan. As we all know there is an explosion of work being done by Japanese designers and comic makers. Several great products have come from their shores in the last decade or so from the waterbrush to great pen holders and nibs. Similar to the Speedball/Hunt 512 and 513, you can find the Nikko Saji No. 357 and the Zebra G. I prefer the G over the Saji because I can get my lines so thin they look like strands of loose hair. 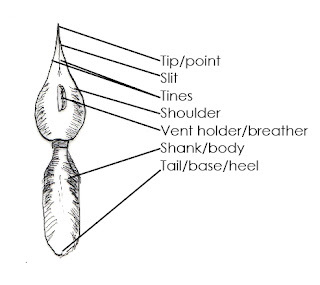 There also nibs that are similar to the crow quill, which are called Maru nips or mapping nibs. 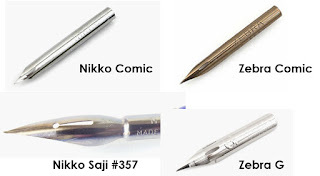 I like the Nikko Comic Pen, but my biggest preference is Zebra Comic because it is less flexible (the tines don't spread apart easily) than the Nikko product and again, I can create wonderful thin lines. Of course there are many other nibs to use, but these are the ones I use the most. One can't get anywhere with just the nibs. You must have a holder. The standard ones I use are through Speedball. However, if you are going to use the Japanese nibs at all, I would suggest getting a Deleter nib holder. 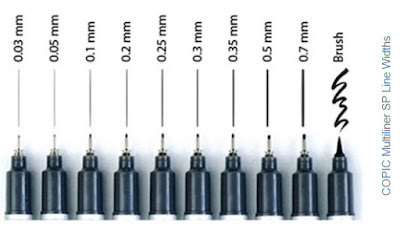 The Japanese nibs are made just a hair thinner, so they fall out of the standard holder. 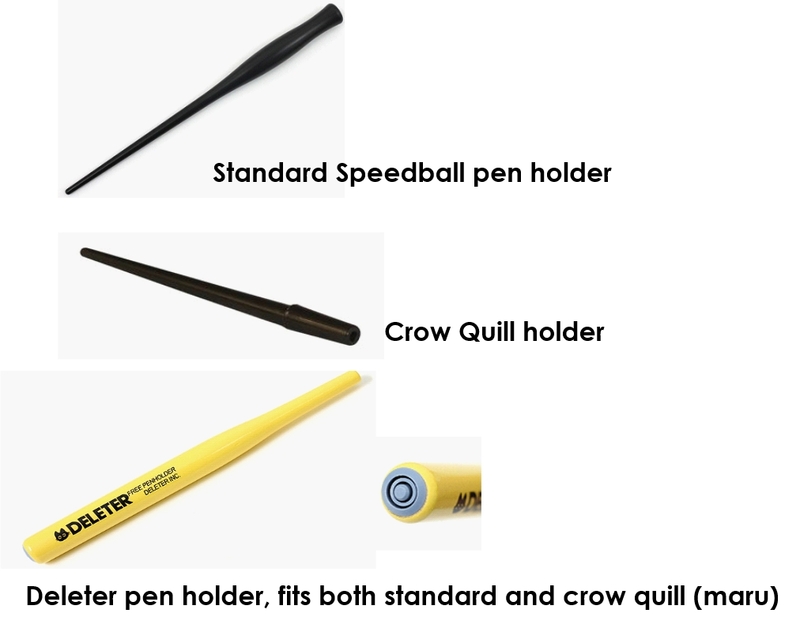 Plus, the Deleter holder accommodates both the crow quill (maru) and the standard nib. So it's like getting two holders in one. And now for the fun part. During the past ten years while I've been working with ink, I've noticed a color change. I usually stick with Black India Ink, either the Higgins or Speedball brands. Both have been around forever it seems. Then one day I noticed the Winslow-Newton brand with cute little jars of color. I purchased them, but the colors really didn't wow me. While performing demonstrations at Art Media (a local art store in Portland, Ore., now defunct), I ran across Liquitex acrylic inks. Oh my goodness, things changed from that point forward. They are rich in color, permanent (very important), non-clogging, fast drying and best of all, can be used like a watercolor when diluted. They have 30 colors. The other acrylic ink brand is FW by Daler Rowney. They offer 38 colors and react the same as any other acrylic ink. The difference between them, and others, is that they have process yellow, process cyan and process magenta--the three colors I like to use for mixing. 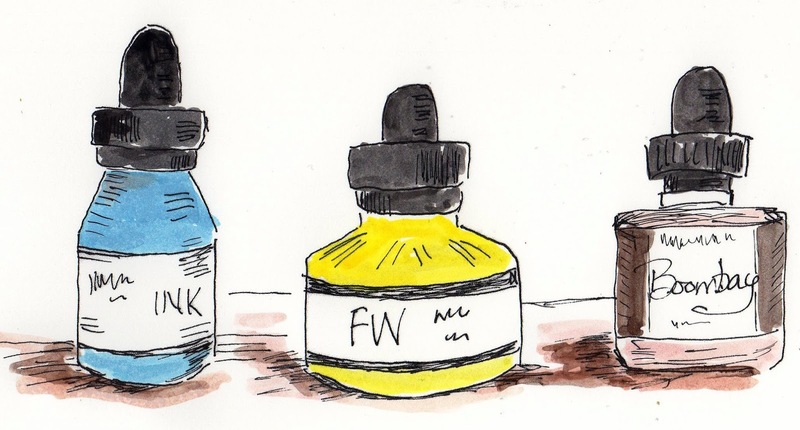 As you all know, my watercolor and acrylic paintings are only done in these three colors and I find the same joy with the FW inks. Not long after I learned about the acrylic inks, I ran across the Dr.Ph.Martin's Bombay colored India ink. Wow! I must have died and gone to art heaven because they are even more fun. They too are permanent, colorfast and dilutable. The colors are brilliant and they are cheaper in price than the other colored inks. 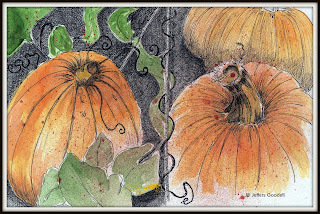 While I enjoy playing with the colored inks for highlights, in my journals, collages and so on, you'll find me using the India ink and dip pen to create my ink drawings. Perhaps it's just a habit. I suspect though that when I work with my ink, I really use a lot of it and I feel there's not space for color. 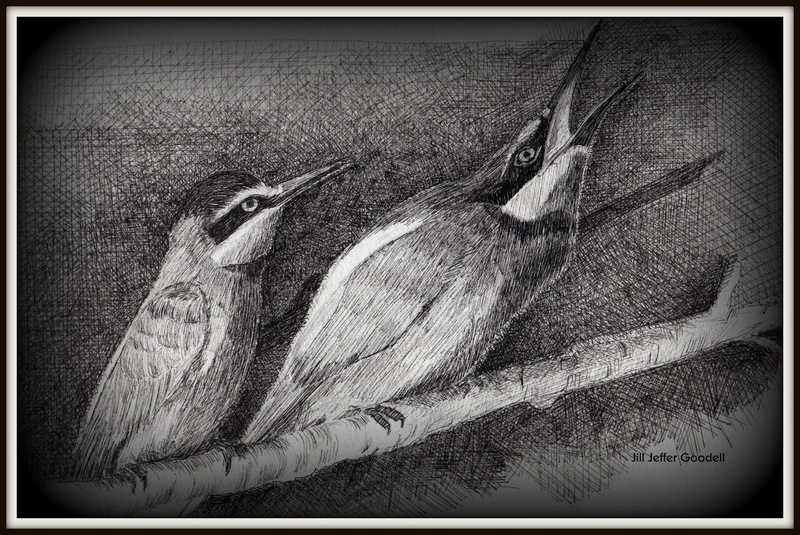 Here are some of examples that I've done in our pen and ink weekly class. The process is slow, but rewarding. 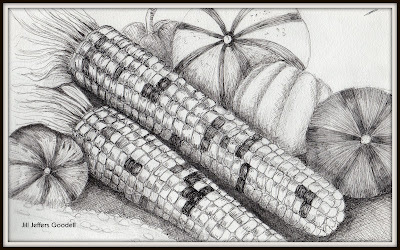 I will most likely color the top corn picture. To do this I will copy the picture onto Bristol or some study cover stock and then paint it, leaving the original alone (as I've done for the ink bottles drawing above). For the second picture, I think I will leave it alone except for adding a bit of red in the birds' eyes for dramatic effect. 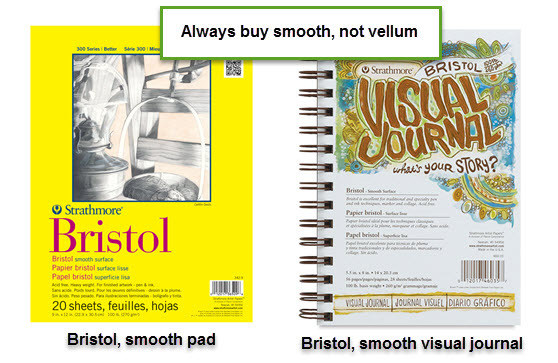 When to color depends on how much ink you have on the page and/or what do you want to emphasize. The picture below (and from the top) was done awhile ago. It began as watercolor, then I added ink and splattered color on top. The upper leaves were done in colored India ink and then painted over with watercolor. Very versatile. 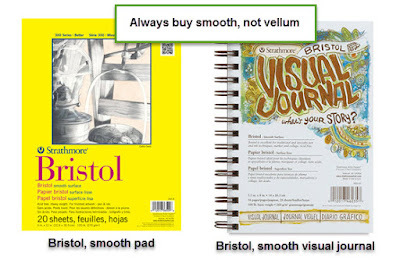 There's more to learn about pen and ink, which I will cover in next month's issue, including paper choices, line techniques and applying of washes. Hope to see you then. 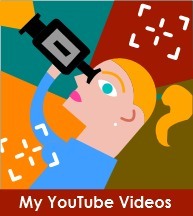 please go to my website: www.jillgoodell.com.